Janet Echelman’s iconic aerial sculptures have transformed unremarkable cityscapes on five continents into lush, colorful downtown vistas. 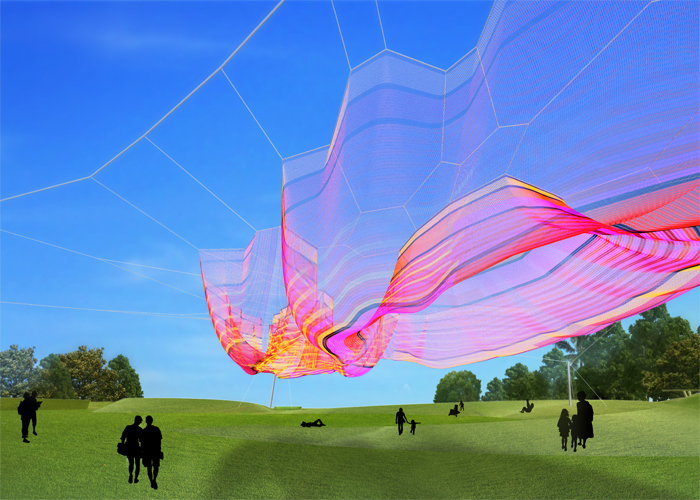 On Wednesday, Echelman unveiled the design for the public installation that will bring her art to her native Tampa Bay area. “Bending Arc” will be a flowing, net sculpture on the approach to the St. Petersburg Pier inspired by memories of the former pier, where Echelman played as a child, and the beach. The sights of barnacles nestled together on the old pier structure and a brightly colored sea of overlapping beach parasols sparked the design. Bending Arc rendering for the new St. Pete Pier. The sculpture’s title drew inspiration from a quote from 19th-century Boston Unitarian preacher Theodore Parker: “I do not pretend to understand the moral universe, the arc is a long one ... but from what I see, I am sure it bends towards justice.” Civil rights leader Martin Luther King Jr. quoted the phrase in an article and several speeches. Echelman said she chose the title because her art is intended to be for everyone. The $1.3 million sculpture will be a gateway feature on the approach to the new pier. It will be the Tampa native’s largest permanent sculpture to date, reaching a height of 76 feet and a width of 428 feet. It will be made from 84 miles of high strength Polytetrafluoroethylene fiber and include more than one million knots. Echelman, 52, set out to be an artist after graduating Harvard University, but never intended to be a sculptor. She won a Fulbright Lectureship to teach painting in India but the paints she shipped overseas never arrived. With an exhibit date approaching, she made bronze sculptures that were far too small for the large gallery space she had to fill. Walking along the beach in India, she saw fishermen weaving their nets and the creative inspiration hit her. From her first works, she was enamored with how the wind would make the surface of her aerial net sculptures ripple and change shapes. In Phoenix, Boston, the coast of Portugal and elsewhere, Echelman’s LED-illuminated installations have drawn crowds of locals and tourists who often will lie on the grass under the sculptures and watch them shift in the light and wind. “It is really the fulfilment of a dream to bring my art home,” she says. Her mother, Anne Kantor, is a jewelry designer in Tampa. “Bending Arc” is currently scheduled to be completed in December. Private fundraising will cover the sculpture’s costs, while public monies will pay for the related site work and the $80 million Pier District project. The unveiling took place at the ULI Trends conference in Tampa.